What would te do if te saw France in real life? Would te go out with France? How do te spell his laugh? Which color do te think fits Francis the best? Have te ever been to France? 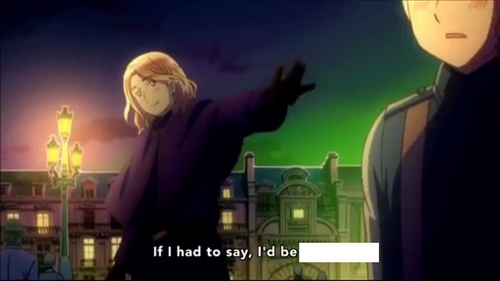 If te had to discribe France in one word, what would it be? Why do te like France? So. If te were to be on a data with France what would happen? As te enter your apartment, there Francis is. "Come on… almost….there…" te muttered to yourself, standing on the tips of your toes and stretching your arms as far as they would reach. te finally managed to hang the ornament and sighed happily, stepping down from the step-ladder. Hands on your hips, te looked up at the impressive X-mas albero festooned with ornaments of all shapes, sizes, and colors, nodding to yourself satisfactorily. Interrupted whilst te were in the middle of your book, te exclaimed, “Oi! I was reading, te wanker!” Swatting away the handsome Frenchman, te scowled as he attempted straddling you, lips seeking yours. “Hey! Hey!” Your protests were to no avail, however, and Francis was Victorious as he planted a baciare upon your flustered lips. te never were big on the whole 'love' concept. Your parents, loving as they were towards you, went through a nasty divorce that started on the giorno of your 16th birthday. Your elder sister suffered through abusive/controlling boyfriends in rapid succession; te thought she was on boy number 13, at least if your numbers were correct. At least so far this guy seemed decent enough. After having been to the meetings and begging England oh so many times to let te be some sort of personification, he finally found a place for you. He allowed te to personify his capital city of Londra just so long as te would leave him alone! So, feeling quite pleased with yourself and eager to help England with what he called 'foreign relations', te were immediately out of the house to talk to people. a comment was made to the poll: Which color do te think fits Francis the best?